Our hero is Jay Bartlett, a young Canadian man working in a local videogame store in Ontario. He is obsessed with collections. When we are first introduced to him we see a huge Star Wars collection, with life-sized statues in his living room. 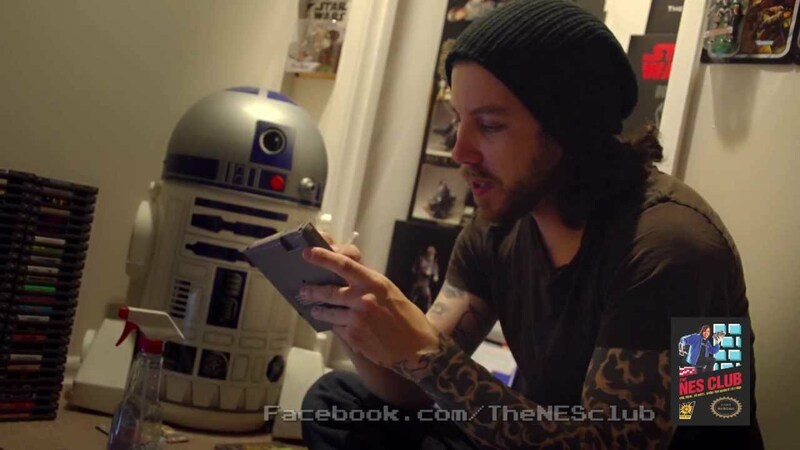 He is also a fan of the old Nintendo games from the 1980s. He is ready to take on the 30-day challenge of buying all 678 games for the old console without using the internet. He has to buy every single game in retro stores or from collectors who are willing to sell them. The challenge becomes a quest across North America if not the world; but it actually starts with friends’ houses, grabbing some rare jewels for a bargain. However, it is hard to define a bargain as at no point does the film disclose the amount of money paid for a transaction. The film constantly refers to the top 20 of the rarest games, but there is no monetary value in consideration. The film is intercalated by featurettes by McCallum explaining the story of Nintendo, why some of the games are considered rare, always adding some bits of information for the next scene. While these are interesting, the quality varies a bit and it feels a little too biased, too much of a commercial. The narrative structure is also a bit too gamey, not real-world enough to, for example, explore issues such as purchasing via eBay, the rivalry between collectors or inflating prices. One moment that does ramp up the human drama is when Jay starts speaking to the camera about his father. In that moment, Jay stops being an uber-geek and becomes humanized, a sensitive man who has had some problems in the past about adaptation and rejection. One glimpses a connection between his obsessive collections and his introvert nature. The director however only hints at this before focusing again on Jay’s quest. The film would be better with more stuff like that. The 30 days take up 90 minutes on your screen and the ending will leave you both satisfied and disappointed at the same time. As regards crowd funding, this is obviously a film made for the gamer community by one of their own. While that is worthy of recognition, it does limit the scope of the film, because McCallum does not want to displease his backers. That means that he makes the effort to make a film that the games aficionados will surely like, but it could have been an experience more open to everyone who remembers Mario’s theme song by heart. Nintendo Quest is a good film if you are interested in collecting games or if you want to dive into 80s nostalgia. If you are looking at going down Nintendo memory lane, there are other documentaries that might be more interesting. Nintendo Quest stays focused on its own challenge and it is interesting but it is not mind blowing.